Technical analysis by utilizing a price action strategy can be one of the easy and useful methods in trading your binary options. It is said to be easy because the method of observation is simple and does not require any additional indicators, and is fairly useful because it is quite effective to be used as a reference in identifying the direction of the next price movement. 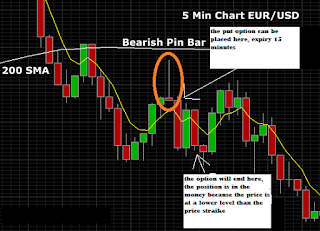 Strategy Pin Bar, or also known as Pinocchio Bar, is one of the price action methods that rely on candlesticks. The Pin Bar can be identified from the very long axis of the candlestick that exceeds the body part. The Pin Bar signifies a reversal or reversal, provided that the longer the axis appears, the greater the chance of the reversal. Why is the Bullish Pin Bar actually marked with an axis that extends below the candle? Doesn't that mean the price has just reached the lowest level of the downtrend? This is why the shape of the candle is called the Pinocchio Bar. In the Pinocchio story, the more often he lies, the longer his nose will be. Likewise with the Pin Bar, the longer the axis of the 'lie', the greater the potential for reversal in price. Here, the very long axis of the candle is interpreted as a 'lie', which seems to indicate the price movement will move according to the position of the axis. For example, the long axis above the candle should show a price that can reach the top level. However, what happens next is the price actually reverses direction and then moves to a lower level. Therefore, the long axis located at the top can then be interpreted as a bearish reversal, while the axis position at the bottom is indicated as a bullish reversal marker. Please also note that there are no special provisions stating that the Bullish Pin Bar must be closed at a higher price level (the candle is green), while the Bearish Pin Bar must also have a close position lower than the opening level (red candle). For example, the Bullish Pin Bar remains valid even though the price closes at a level lower than the opening price. The same is true for Bearish Pin Bars. For this reason, an indication of the Pin Bar that shows the direction of the reversal is fully determined by the longitudinal axis position exceeding the body candle (the highest or lowest price), not the closing price. Red candles can also be interpreted as Bullish Pin Bar as long as the position of the long axis is at the bottom, as well as for the green candle which can indicate a bearish reversal if the axis position extends above the candle. The condition of the Pin Bar actually reflects market behavior that shows the strength of rejection and the existence of a break in a certain level. The length of the candle axis that exceeds the size of the candle itself indicates the strong resistance of the price to move further towards the same trend. For that, the longer the axis size and the smaller the shape of the candle will increase the reversal opportunities. This can be a convincing rule of thumb for your binary options strategy. Even though it looks easy, you still need to recognize certain Pin Bar conditions to be able to increase trading opportunities with this strategy. 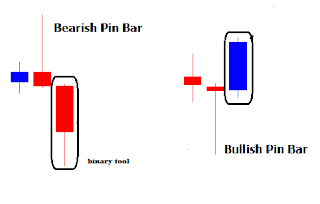 Apart from recognizing the shape of the Pin Bar which indicates a bullish and bearish reversal, there are provisions to confirm the reversal so that you are not trapped to quickly pick up the option as soon as a Pin Bar is formed. In addition, there are also additional indicators that can help you to be able to take option positions more convincingly. To recognize the perfectly confirmed Pin Bar, there are two sides that you need to pay close attention to. First, the shape of the Pin Bar itself and its position against the previous candle. Second, the closing position of the candle formed afterwards. Long axes only form on one side of the candle. It would be better if the candle doesn't have any axis at all in the other part. For example, the validity of the Bullish Pin Bar is obtained from the tail of the candle that extends at the bottom of the candle, with the upper axis not too long or none at all. To help you identify the Pin Bar more easily, make sure if the candle axis is formed three times longer than the body candle. The open and close positions of the Pin Bar are not too far from the previous candle. Pin Bars are always formed in the area adjacent to the candle before and after. Even though it only consists of 1 candle formation, Pin Bar must still be confirmed by another candlestick formed afterwards. This method is done in anticipation of signal or price errors that will still move in the ranging range before finally experiencing a reversal. In a bullish reversal case, you can wait until the candle after the Buliish Pin Bar has finished forming. 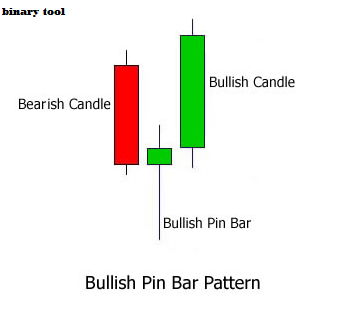 Make sure if the candle is closed at a higher price than the Pin Bar. Conversely, the closed candle is lower than the closing price The Bearish Pin Bar can be a confirmation of the reversal towards the downtrend. 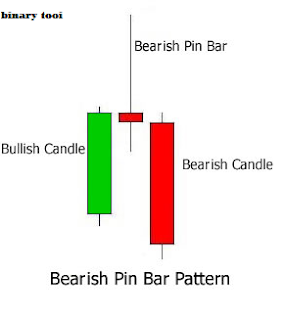 In the example chart below, the Bullish Pin Bar formation is confirmed by the formation of the next candle which closes higher. While the Bearish Pin Bar formation can be ascertained by the formation of the second candle which closes lower than the Pin Bar itself. This method can confirm the possibility of a reversal that will occur. You can start placing the "put" option if the candle after the Bearish Reversal Pin Bar is closed at a lower price. Conversely, the "call" option can be taken after you ensure that the Bullish Reversal Pin Bar is followed by a candle that has a higher closing price. When prices are trending, Pin Bar can appear to mark a reversal of the main trend or from a retracement that often appears and shows a temporary reversal of a long-term trend. If the Pin Bar appears to end a retracement, the pattern of the candle shape also functions as a trend forward indicator. You can use the help of the Simple Moving Average indicator (SMA) to analyze the pattern of price movements with the Pin Bar strategy on the market that is trending. The example chart below illustrates the use of 200 SMA on the EUR / USD chart in the 5 minute time frame. The bearish EUR / USD trend is indicated by the price position moving below the 200 SMA. 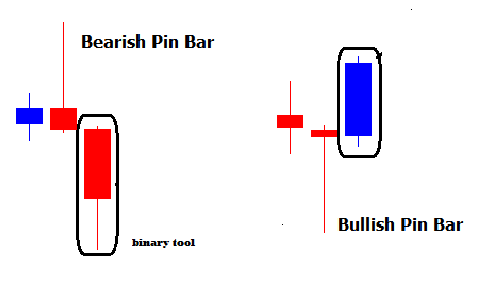 Pin pointing bar Bearish reversal occurs when a retracement that shows as if the price will move up and leave its bearish trend. Here, the Bearish Reversal Pin Bar that appears below the 200 SMA indicates a failure of the price to turn and break the SMA level. Thus, an indication of the Pin Bar indicating the price resuming its downtrend can you use to place the "put" option. You can use an expiry time of 15 minutes as the deadline for ending your binary options trading. The above example shows that the "put" option placed with an expiration time of 15 minutes will end in-the-money. If you wait for the formation of the second candle after the pin bar, you can still make a profit because it can be seen that the next 3 candles are formed at the price level lower than your previous entry position. The 200 SMA in the chart above can function as a resistance limit. The use of Pin Bars is also always associated with the establishment of support and resistance levels so that you can get a reversal position which is increasingly confirmed. Price conditions that cannot penetrate the key support or resistance limits can also be called bounces. If prices have been able to penetrate these boundaries but then turn back, then the condition is called fakeout. Here, Pin Bar can help you anticipate fakeout by recognizing the formation of a Pin Bar at a price level that looks like it will break a support or resistance limit. Generally, price breakouts from both levels are always responded to with a breakout strategy. But if it's just a fakeout, then it's the bounce strategy that you must implement. For this reason, if you encounter a Pin Bar on a pattern of price movements that seems to move through a support or resistance limit, make sure not to immediately place the option. It's a good idea to wait for the next candle to form to form a Pin Bar formation and apply a bounce strategy to install the next option. 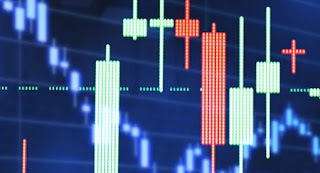 There are many ways you can choose to improve your binary options trading strategy. Utilizing the price actions method with Pin Bars can be an easy and effective solution if managed correctly. Although it seems easy, the use of the Pin Bar strategy still requires perseverance in practice. Pin Bar Formation can indeed show promising reversal opportunities, but you still need to practice using this method with adjustments to the right trading time, especially to choose the most appropriate time frame and expiry time. Determining entry and exit positions can be the key to your trading success. Therefore, practicing to estimate the position of the candle that can confirm the Pin Bar as an entry point, and when that new trend will survive to find the right exit position is an effective learning process. This method will encourage you to develop a binary options trading system with a price action strategy. Some traders say that trading with Pin Bars is less suitable for market conditions that are being consolidated, because the Pin Bar is formed at a less convincing price position. However, there is also a mention that this strategy is not suitable for use in trending conditions, especially when price volatility is increasing. Apart from all that, you can use the help indicator to help your technical analysis with this one price action method. There are types of trend indicators and key levels on support and resistance that can be used to strengthen the way of trading binary options with the Pin Bar strategy.